Bihar Chief Minister Nitish Kumar's cabinet has 28 ministers, 19 of them first-timers. They range from a dozen who studied up to various stages of school. Here's a comprehensive list. In a Bihar cabinet where Lalu Prasad’s two sons are the youngest members, both in their twenties, none of the other 26 ministers is under 40. The 28-member cabinet’s average age is 52, not counting Chief Minister Nitish Kumar, 64. One-fourth of the ministers are above 60, four of these from the JD(U) and three from the RJD, while all four Congress ministers are between 40 and 60. 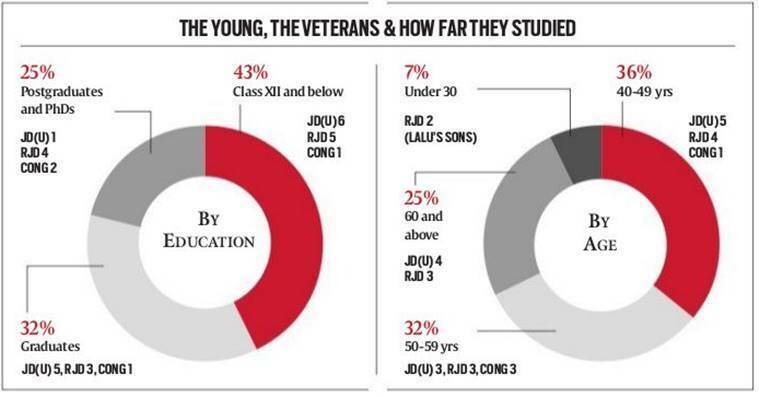 The 28 ministers, 19 of them first-timers, range from a dozen who studied up to various stages of school — including both of Lalu’s sons — to seven postgraduates, four of these from Lalu’s party. The CM is an electrical engineering graduate. Jay Kumar Singh: Industries and Science & Technology Minister, 46, is a civil engineering graduate. He defeated the BJP’s Rajendra Singh to take Dinara for a second time. An upper caste Rajput with the JD(U). Ramvichar Rai: Agriculture Minister, 60, has been a minister and RJD chief whip earlier. He defeated Raju Kumar Singh of HAM in Sahebganj. Rai studied till Class X.
Chandrashekhar: Disaster Management Minister, 53, is a second-time MLA from Madhepura, where he defeated the BJP’s Vijay Kumar Vimal. An MSc, he used to teach at a college. A Yadav leader with the RJD. Kumari Manju Verma: Social Welfare Minister, 46, defeated the LJP’s Anil Kumar in Cheria Bariarpur. Studied till Class XII. An OBC Kushwaha leader with the JD(U). Shivchandra Ram: Arts, Culture & Youth Affairs Minister, 44, is a graduate and the RJD’s state youth wing chief. He defeated the LJP’s Ramnath Ram in Rajapakad to become an MLA for the third time. An SC leader. Maheshwar Hazari: Urban Development and Housing Minister, 46, is with the JD(U), an SC leader related to Ram Vilas Paswan and a son of leader Ramsevak Hazari. He defeated Ramchandra Paswan’s son Prince Raj in a family battle in Kalyanpur. Studied until XII. Shailesh Kumar: Rural Works Minister, 52, became MLA for a third time beating the LJP’s Himanshi Kuwar in Jamalpur. An EBC Dhanuk leader with JD(U); Masters degree. Abdul Jalil Mastan: Registration and Excise Minister, 57, is a veteran Muslim face with the Congress and won his eighth MLA poll, beating the BJP’s Saba Jafar in Amour. Once refused to become a minister in Rabri Devi’s cabinet. Passed Class XII in commerce. Madan Mohan Jha: Revenue and Land Reforms Minister, 56, is the state Congress’s Brahmin face. An MSc and PhD, he is an MLC and a son of former minister Nagendra Jha. Tej Pratap Yadav: Lalu’s elder son is Health Minister and No. 3 in the cabinet, after the CM and his brother. Declared his age as 25, which would make him “younger” than his brother as per records and the “youngest minister”. He defeated HAM’s Ravindra Rai, sitting MLA, in Mahua. Studied until Class XII; ran a motorbike showroom. Vijay Prakash: Rewarded with Labour Resources for his family’s loyalty to Lalu’s. Vijay Prakash, 45 and a postgraduate, is a brother of Banka RJD MP Jaiprakash Narayan Yadav and defeated Ajay Pratap Singh, son of former minister Narendra Singh, in Jamui. Tejaswi Prasad Yadav: Lalu’s younger son, 26, is Nitish’s deputy and Roads Minister. A former cricketer, he played for Jharkhand and was also part of IPL for four seasons without a match. Tejaswi defeated the BJP’s Satish Kumar in Raghopur. Studied until Class IX. Lalan Singh: Also known as Rajiv Ranjan Singh, 62; he has Water Resources. A former JD(U) state president and now an MLC, he was the Munger MP between 2009 and 2014. Once close to Nitish, he fell out with him, patched up and came back to become a minister. An upper caste Bhumihar. Chandrika Rai: Transport Minister, 53, was an RJD minister under Rabri. Son of Daroga Rai, Bihar’s first Yadav CM, he is a postgraduate in arts. He defeated the LJP’s Chhotelal Rai in Parsa. Abdul Bari Siddiqui: Finance Minister, 63, has been RJD minister before, as well as leader of opposition. He carries the image of a moderate acceptable across parties. He won once again from Alinagar, defeating the BJP’s Misrilal Yadav this time. A product of the JP Movement, he studied till Class XII. Ashok Kumar Choudhary: Bihar Congress president, 47, is an MLC who gets Human Resource Development and Information Technology. The Dalit face of the Bihar Congress, he is a son of former minister Mahavir Choudhary and was a minister in Rabri’s government. Has a doctorate degree. Bijendra Prasad Yadav: At 69, the most senior minister. He retains Energy. A JD(U) veteran hailing from the JP movement, he has been an MLA since 1990 and is seen as close to Sharad Yadav. He studied until XII and is widely respected for his understanding of politics and clean image. He defeated the BJP’s Kishore Kumar Munna in Supaul. Santosh Kumar Nirala: Dalit leader, 44, gets SC/ST Welfare. he came from the BSP, joined the JD(U) and beat Vishwanath Ram (BJP) in Rajpur. Second-time MLA; graduate. Awadhesh Kumar Singh: One of two upper caste Rajput ministers, he gets Animal Husbandry and Fisheries. Veteran Congressman, 59, defeated the BJP’s Virendra Singh in Wazirganj. He was a minister in the Chandrashekhar Singh government too. Alok Kumar Mehta: A former RJD MP, 44, he is Cooperatives Minister. He is known as a loyalist of Lalu’s family and said to have groomed Tejaswi in politics. An OBC Kushwaha and son of former minister Tulsidas Mehta, he defeated the RLSP’s Anant Kushwaha in Ujiyarpur. Muneshwar Choudhary: Mines Minister, 60, is the RJD’s state vice president. He defeated the BJP’s Gyanchand Manjhi in Garkha for his fifth term as MLA. Belongs to the Pasi scheduled caste. Madan Sahni: Food and Consumer Protection Minister, 44, is the JD(U)’s EBC Mallah face. He is a second-term MLA and a graduate. He defeated the LJP’s Vinod Sahni in Gauraboram. Firoz Ahmed: Sugarcane Minister, 53, is also known as Khurshid. He defeated BJP heavyweight Dilip Verma in Sikta. He studied till Class X and is a second-term JD(U) MLA. Krishnandan Prasad Verma: OBC Kushwaha leader, 45, is a graduate who has become Minister for PHE and Law. He defeated sitting Ghoshi MLA and HAM candidate Rahul Kumar, a son of former MP Jagdish Sharma. Kapildeo Kamat: Minister for Panchayati Raj, 60, is an EBC Kyot leader with his roots in the JP movement. He defeated the LJP’s Vinod Kumar in Babubarhi. He did not complete his matriculation. Abdul Gafoor: Minority Affairs Minister, 56, is an MA and doctorate degree holder who taught at a college. The old Lalu aide defeated the LJP’s Chandan Kumar Sah in Mahisi for his fourth term as MLA. Anita Devi: Tourism Minister, 45, studied till Class XII. She defeated BJP veteran Rameshwar Chaurasia in Nokha in what was her first election. She belongs to the EBC Nonia caste. Shravan Kumar: OBC Kurmi leader, 56, gets Rural Development and Parliamentary Affairs. He studied till Class XII. A former JD(U) chief whip as well as minister, he is said to be close to the CM. He defeated the BJP’s Kaushlendra Kumar in Nalanda.